Copies may be ordered from the artist. The price is Euro 15 + postage and a small percentage for bank costs. Payment with credit cards possible. 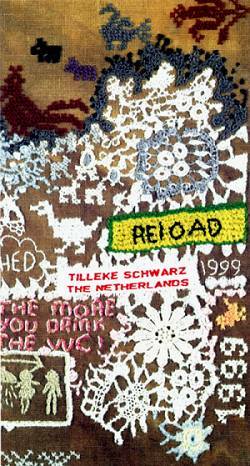 Tilleke Schwarz will show her work at the Knitting and Stitching Shows in the United Kingdom and Ireland in 2007. The artist has that special gift to communicate with one and all. The interpretation of what she has to say might well vary, but we feel sure that nobody will pass her gallery without being drawn either to a piece in its entirety or, perhaps, to one minute segment which tells a particular story. There is nothing overtly 'erudite' about Tilleke's work. There is nothing apparently complex. There is certainly nothing 'po-face'. but, of course, all of that encourages you to look again. And, wherever you look you see humour, tears, tragedy, happiness, laughter, criticism and conflict - the full Jewish lexicon. You also get cats. All embroidery pictured in the book is hand stitched with different kinds of thread on linen. The linen is white or dyed. Scraps of lace, tags, etc. are incorporated as 'quotes'. Sometimes a little bit of textile paint is used. 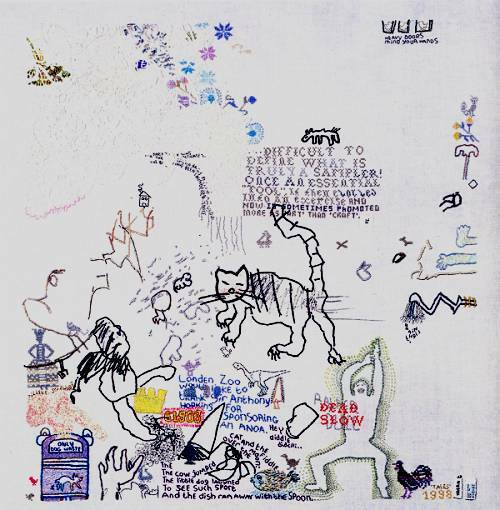 Tilleke Schwarz uses a fair amount of cross-stitch, but it is couching, the sewing of a heavier thread onto the fabric by means of tiny stitches which is her main techniqu. It is couching which she uses to render the text and this enhances the relief qualities of these sewn letters. To counterbalance the intimacy of the stitching process, Schwarz does a great deal of walking away and the looking at the embroidery from a distance. Any viewer is recommended to adopt a similar approach; these embroideries reward both the panoramic and the close-up gaze. Detail from Rites 1999. This work has won the Van Ommeren.